Age Restrictions: Children under 11 will not be admitted. From Sinbad to Ali Baba, join us on a voyage of discovery through the greatest stories ever told! A young servant girl, Dunzayad is to marry the powerful king Shahryar. But this isn’t her husband-to-be’s first wedding – every single night he marries a new girl, and every single morning he has her killed. As she steps up to take her marriage vows, her sister Sharazad can’t stand aside and watch; defiantly facing danger, she bravely sacrifices herself in place of her sibling. With the feast drawing to a close and the end in sight, Sharazad starts to tell stories. And with every fantastical tale she stretches out the thread of their lives a little further, slowly but surely melting her new husband’s stoney heart. 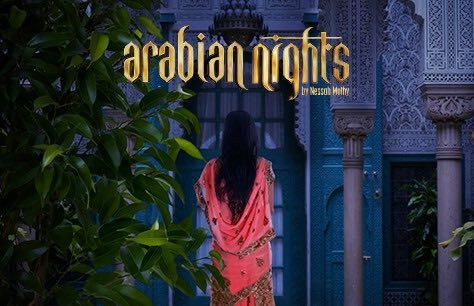 Filled to the brim with music, puppetry and dance, Arabian Nights is the world premiere of a new play by Nessah Muthy, writer of The Host and Heorine. Based on the ancient library of texts, One Thousand and One Nights, it is a celebration of the artistic and cultural history of the ancient Middle Eastern world, with thousands of legends bounding across its pages. Blending tales from ancient Arabic, Jewish, Greek, Indian, Persian and Turkish cultures together alongside a broad range of musical and puppeteering disciplines, this new production stretches across both borders and genre in an evening of storytelling that weaves a tapestry into the future.